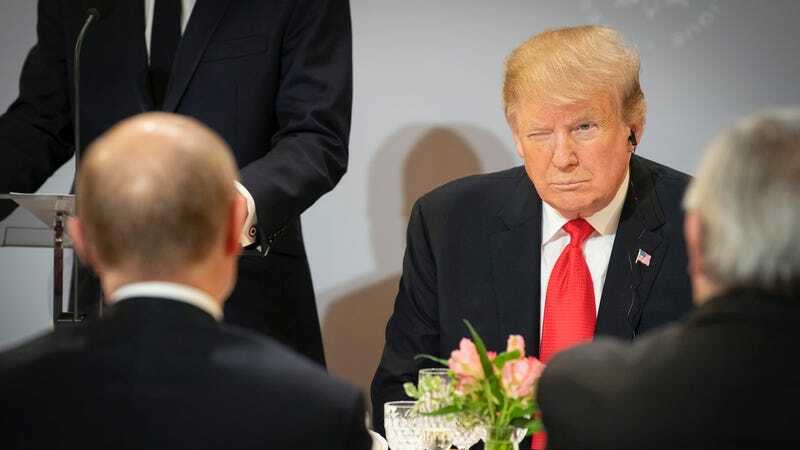 President Trump sits across from Russian President Vladimir Putin during lunch at the Elysee Palace on November 11, 2018 in Paris, France. President Donald Trump tweeted some incredibly ignorant things over the weekend about the wildfires that have so far killed at least 31 people in California. Firefighters have explained repeatedly why the president is so wrong, but CNN meteorologist Tom Sater broke it all down on Sunday to show why President Trump has no idea what he’s talking about. Sater started his segment on CNN by explaining that he enjoys covering the weather because, outside of climate change issues, it’s “neutral” and doesn’t often intersect with politics. But when the president says something this terrible, even guys like Sater clearly have to speak out against it. “Forest management has nothing to do with mountain winds coming down the passes at 70 miles per hour. Or humidity levels in one hour dropping Thursday from 35 percent down into single digits, dryer than most deserts,” Sater continued. Los Angeles County firefighter looks on as the out-of-control Woolsey Fire explodes behind a house in the West Hills neighborhood on November 9, 2018 in Los Angeles, California. 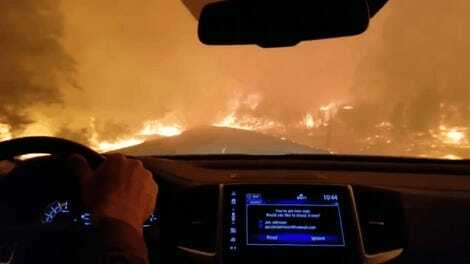 You can watch the rest of the segment on YouTube, where Sater explains how firefighters are “working their tails off,” both in the northern part of the state to battle the Camp Fire and in the southern part of the state to fight the Woolsey Fire. It’s not exactly news that President Trump is a blathering idiot. But when you’ve got the weather guy riled up you know something is very, very wrong. President Trump has always been a danger to national security. But his latest statements are particularly galling, even for Trump. People are dying, and he’s threatening to pull funding. There are only two options: He’s either too dumb to be president or he’s too callous to the suffering of his fellow Americans to be president. Either way, America is suffering because he’s president. And that suffering isn’t going away anytime soon.